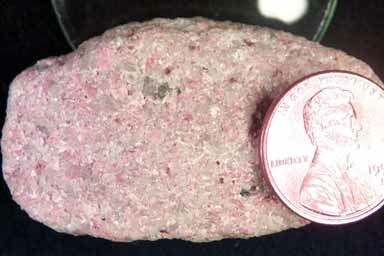 A sandstone with a mixture of quartz and orthoclase feldspar (pink). The sand grains stand out in high relief in this specimen (i.e. there is little matrix) placing this in a sand category. The sand grains here are very large, some even drifting over into the granule size range (2-4 mm) which would technically make this a gravel (conglomerate). We put it here since most of the grains fall into the sand category. Arkoses with abundant feldspar such as this come from the weathering of a sourceland rich in alkali granite. The absence of virtually any other grains other than quartz and feldspar indicate the immediate source of this rock was not a mixed sourceland. A sandstone this clean (i.e. without matrix) indicates a source where chemical weathering was not extreme. The course grain size and relatively good sorting of this sediment implies water transportation, probably in a braided river system.